Cyclopes didactylus is classified as this because their cells have much more structure than those of bacterial cells or archaeal cells and they are much more complex. The cells are comprised of a cytoskeleton which gives the cell structure and they are also composed of organelles inside of the cell like the mitochondria (Tree of Life 2005). Cyclopes didactylus is in the major clade of opisthokonta because its cells once had posterior flagellum that it used to move around with. Check out another member of the clade Opisthokonta, green heron! This kingdom of organisms include all animals that are multicellular, develop from embryos, and ingest their food and then digest it (School Work Helper 2014). Cyclopes didactylus also has more rapid movement compared to plants and some other organisms; this means they are motile (School Work Helper 2014). Here's another member of the kingdom Animalia, frilled neck lizzard! Cyclopes didactylus is classified in this phylum due to having a notochord, which is a semi-flexible structure that helps chordates without bones move (Buchsbaum et al 1987). Another feature of chordates is the dorsal nerve cord, a structure that is hollow and has nerves running through it where the anterior end of it frequently formed into a brain (Buchsbaum et al 1987). One more organism in the phylum Chordata is the giraffe! Cyclopes didactylus is in this class because it has three middle ear bones, hair and mammary glands (Schober 1999). The middle ear bones are referred to as the hammer, anvil and stirrup and their function is to transfer the sound waves from the ear drum to the cochlea and then to the brain. According to the Animal Diversity Web, hair is present at some point in all mammals serving as insulation and aiding in the sense of touch (Schober 1999). The mammary gland produces milk and is a modified sweat gland in females aiding in the nourishment of offspring (Schober 1999). The Asian elephant is also in the class Mammalia too! Cyclopes didactylus is classified as pilosa because it has no incisors or canines, has an expanded ischium, and the cheek teeth lack enamel (University of Massachusetts Amherst 2012). Figure 1. Phylogenetic tree of order pilosa. Image created by M. Haas. Cyclopes didactylus is classified in the family cyclopedidae because it has 64 chromosomes, unlike members of the family Myrmecophagidae who have 60 (Schober 1999) (Junior et al. 2004). Cyclopes didactylus is the only known organism in this classification (Hayssen et al 2012). 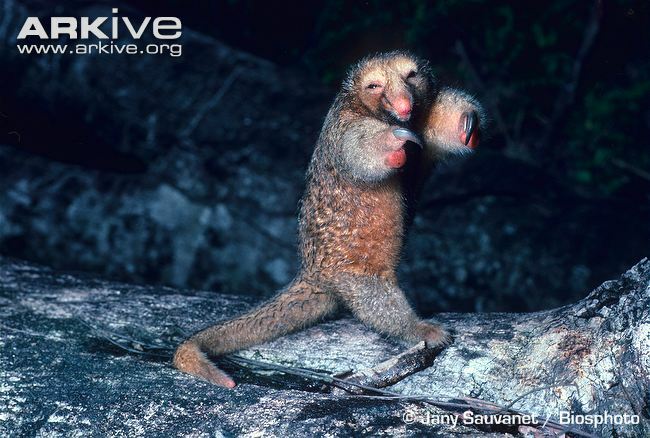 Cyclopes didactylus is different from the other anteaters because it “has a glenoid that is well separated from the porus acousticus and a skull that is strongly tapered anteriorly in lateral view” as stated by Virginia Hayssen (Hayssen et al 2012). Our organisms name means “two-toed circle foot” according to the Latin roots cycl-, pes-, di-, and dactyl- (Hayssen et al 2012). Don't stop now! Go to Habitat!